Robert Turriff creates conceptual sculptures, combining classical and contemporary practices. He prefers working with his hands and values craftsmanship over newer methods using computer modelling. Cultivated skills are utilized in the creation of his pieces, including: sculpting, modelling, casting, molding, painting, and filming. He blends old movie magic with contemporary digital practices. He often works with recycled materials, preferring the unconventional: mass-produced objects not usually used in art production that take on new meaning through the manner in which he combines them. His work explores the changing human relationship with the natural world, often comparing or contrasting the paralleled Vancouver industries of film and forestry. He seeks to integrate the viewer within the environmental wounds we create. His layered worlds combine models and miniatures with classic film tricks and mirrors to immerse the viewer. In addition, he draws inspiration from skilled tradespeople: welders, carvers, and plasterers. Rather than creating with digital imaging/rendering, Turriff keeps alive classic film techniques using mirrors or miniatures, camera tricks, and painted backdrop scenes. Turriff’s creative narrative explores our evolving, and often destructive, relationship with nature. 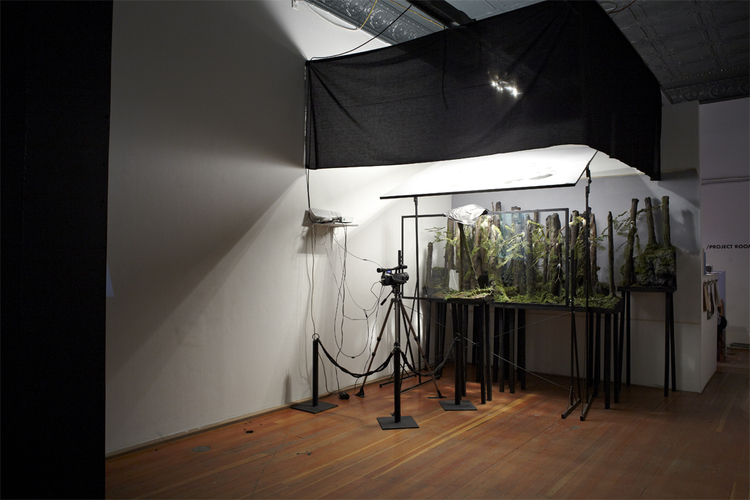 His multimedia installation, Fictive Forests, immersed the viewer in an artificial “meta-forest”. The curated, modeled, and filmed forest comments on how nature is not only mediated but idealized, rarefied and ultimately rendered as imaginary. His future work will submerge the viewer in a combination of digital and modeled forest, confronting with historically seminal acts of violence by European settlers upon British Columbia’s nature, such as: the first time a European encountered a colossus tree and axed it down. What was the first logger who axed a colossus tree thinking? Feeling? What will the last logger who axes the last colossus tree think? Turriff mimics environmental wounds with panoramas depicting human acts of violence on nature. Panoramas, or moving dioramas, were one of the most popular entertainments of the 1800s and arguably the beginnings of the film industry. In a modern world where humans and nature are separated by an increasingly deeper divide, Turriff confronts viewers with the realities of our one-sided relationship with the earth and seeks to engage with a buried spiritual connection humans have misplaced within modernity. His artwork bows to the dominion of nature, questions our place in it, and reflects illusions we tell ourselves.